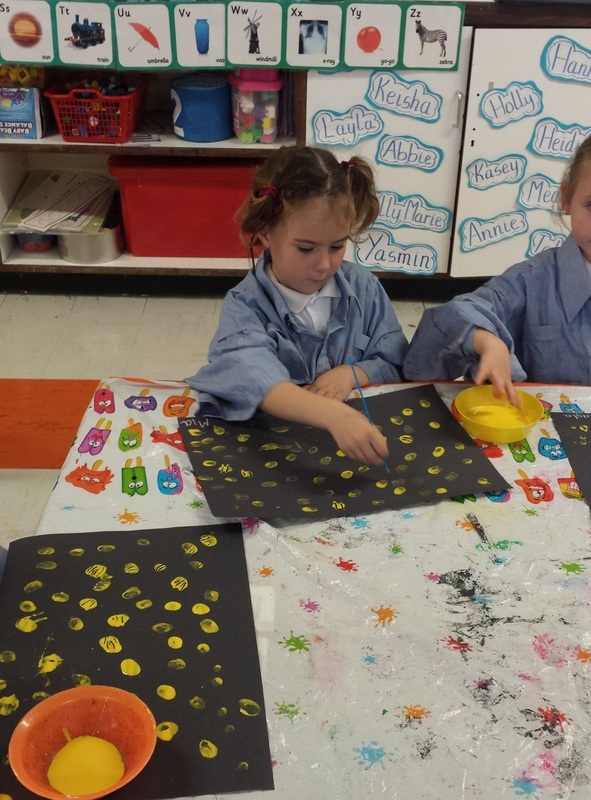 We have been busy working on our Under the Sea theme. 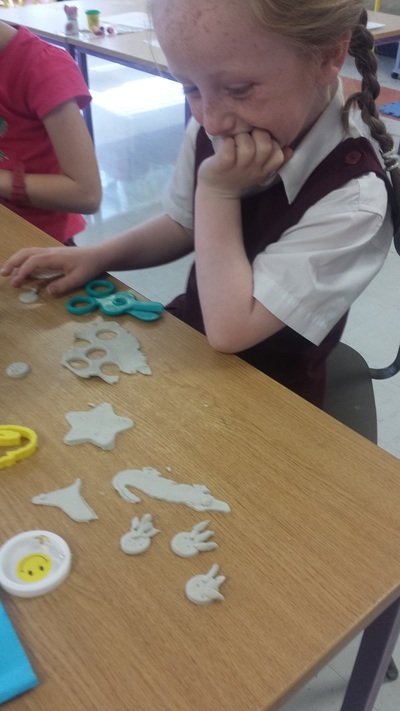 We read the story Rainbow Fish and this inspired us to make some sea creatures in play-dough. 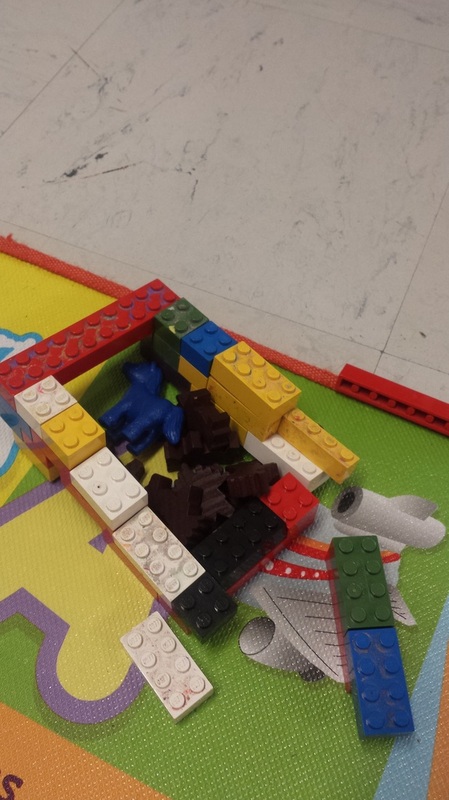 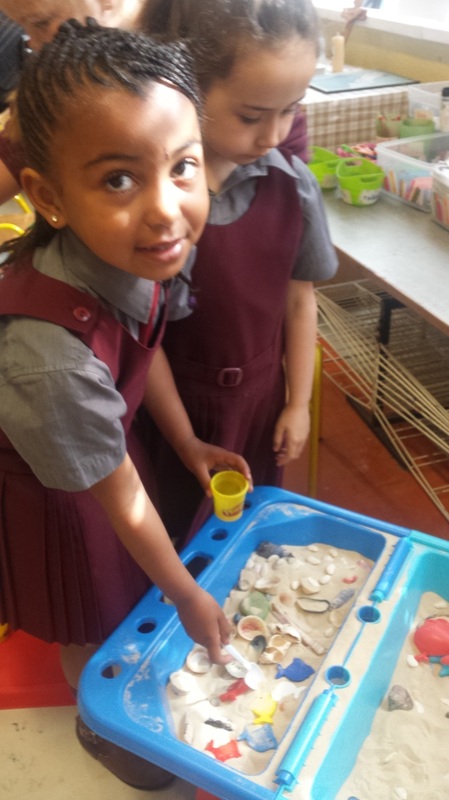 We also created an undersea world at playtime. 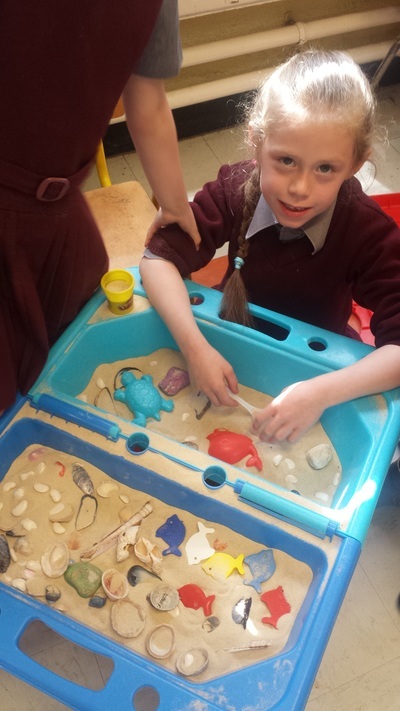 We had great fun playing in the sand area too! During Active Schools Week the girls had an introduction to Ultimate Frisbee. 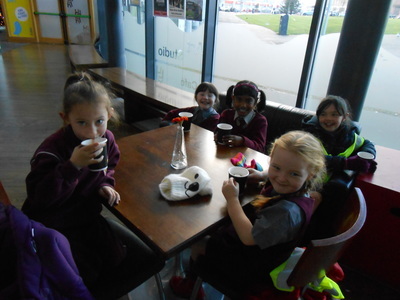 They enjoyed it so much we invited Dominic back for another session. Here are some pictures of Senior Infants being active and having fun! 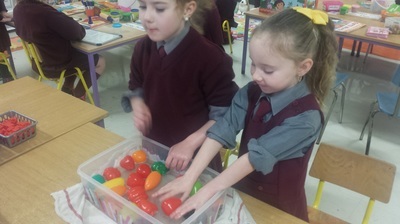 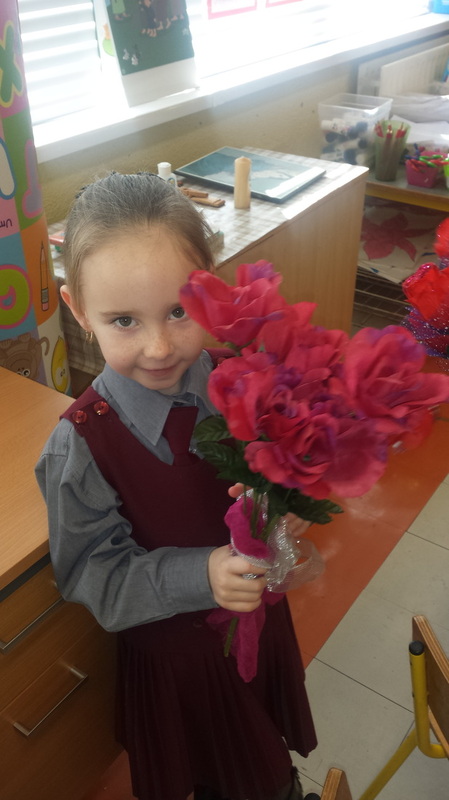 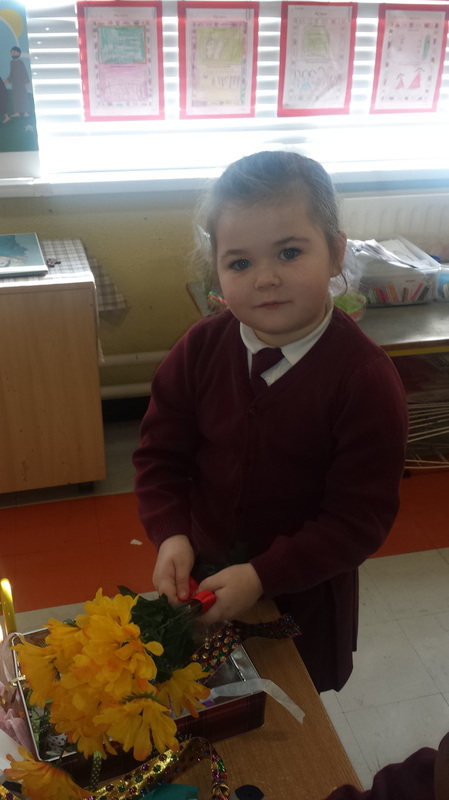 Senior Infants were very busy learning all about Spring. 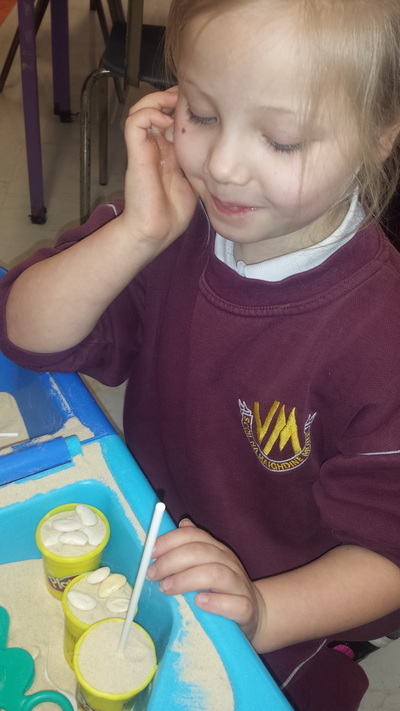 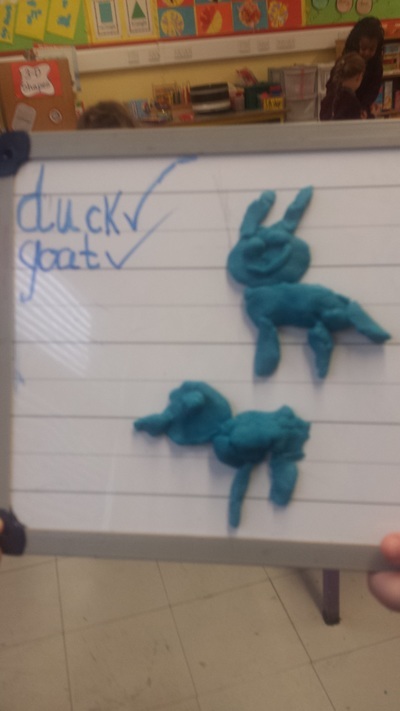 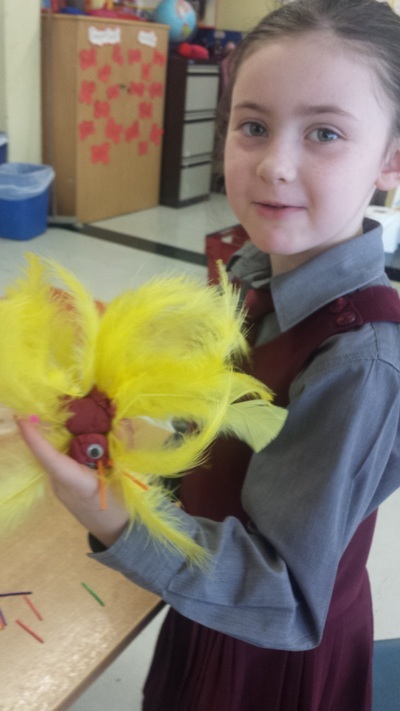 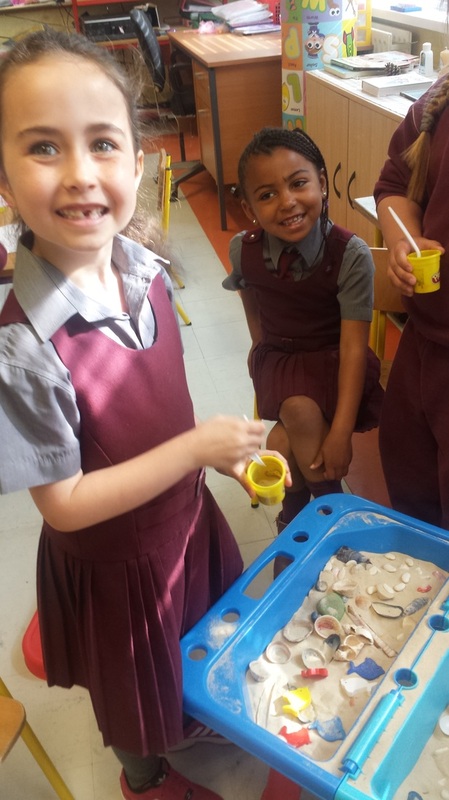 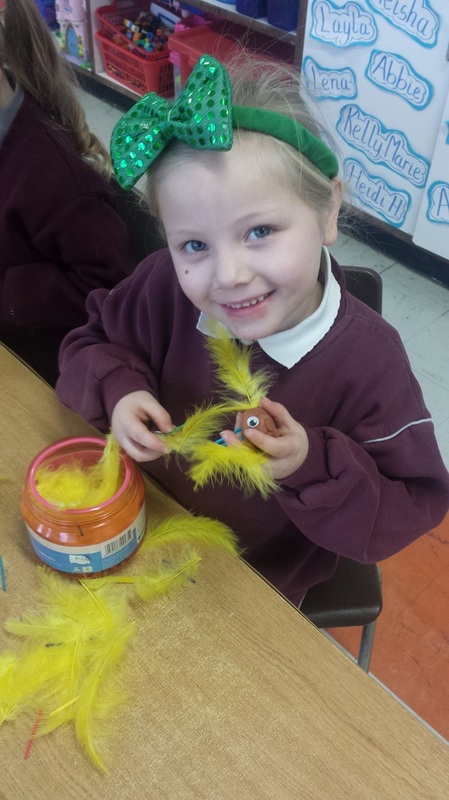 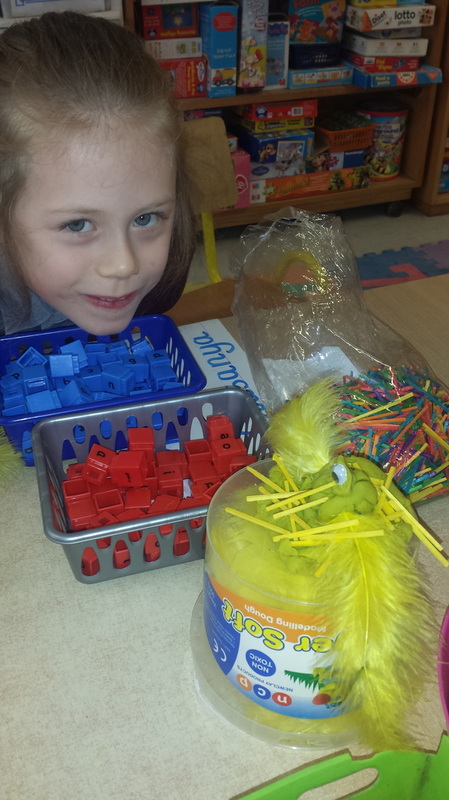 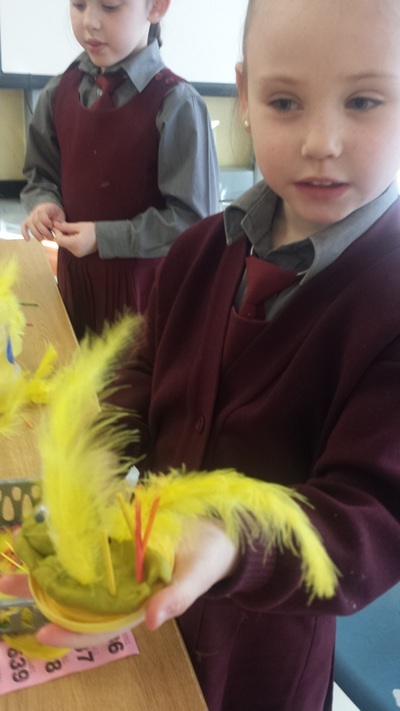 We made little spring chicks using play-dough, feathers and matchsticks. 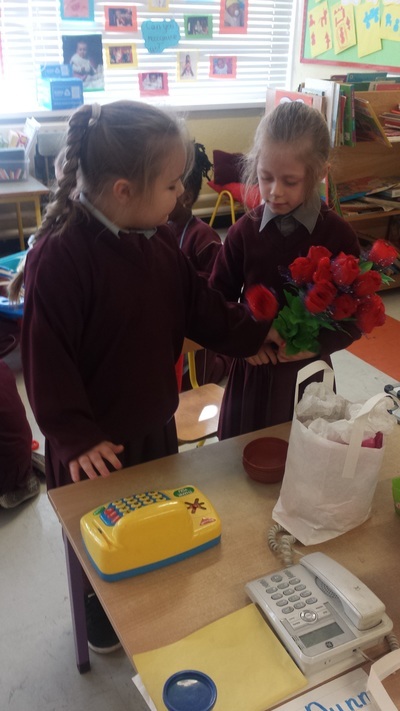 We set up a florists, where we even had security watching the CCTV cameras! 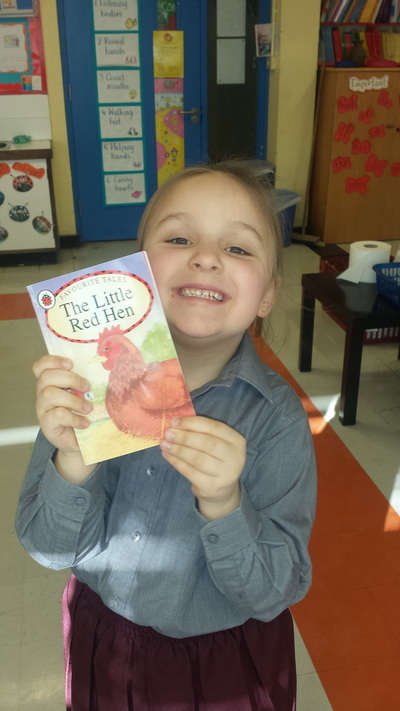 We read the story of the Little Red Hen and this inspired the girls to recreate scenes from the story. 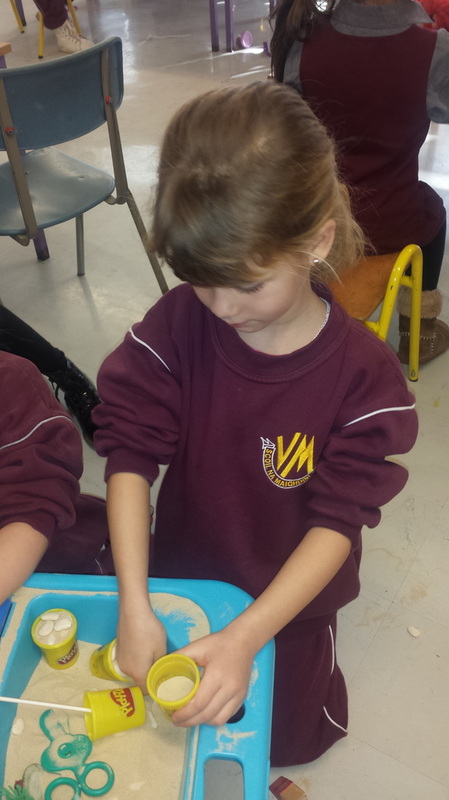 Thanks to Ms Mc Dermott for the yummy pancakes! 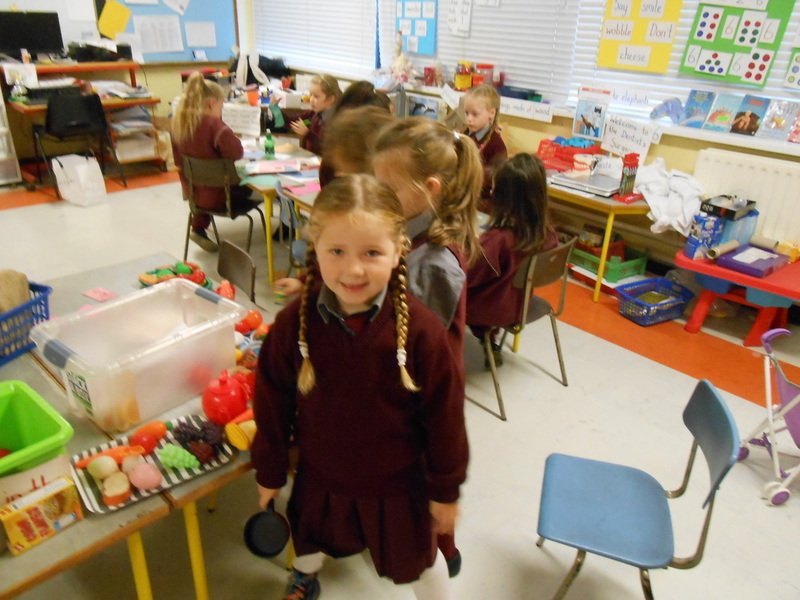 We have been learning all about farming in Ireland and in other countries. 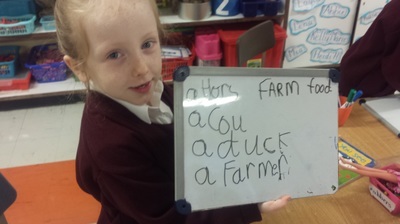 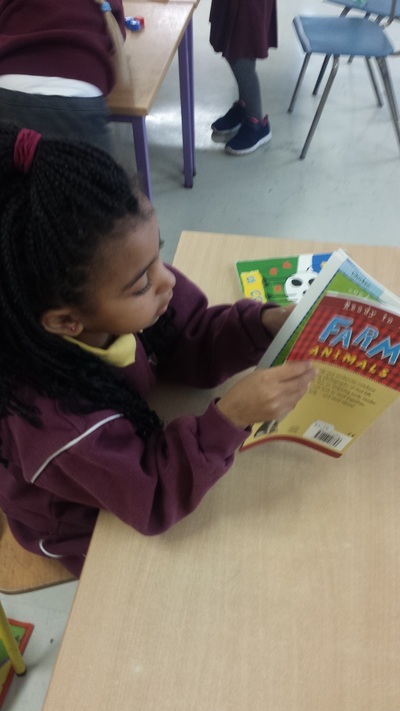 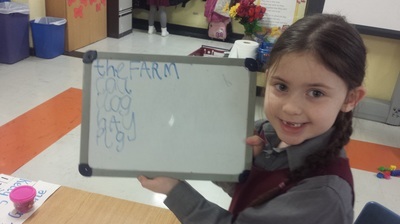 We looked at all the work a farmer does and the girls have been busy reading and writing about the farm. 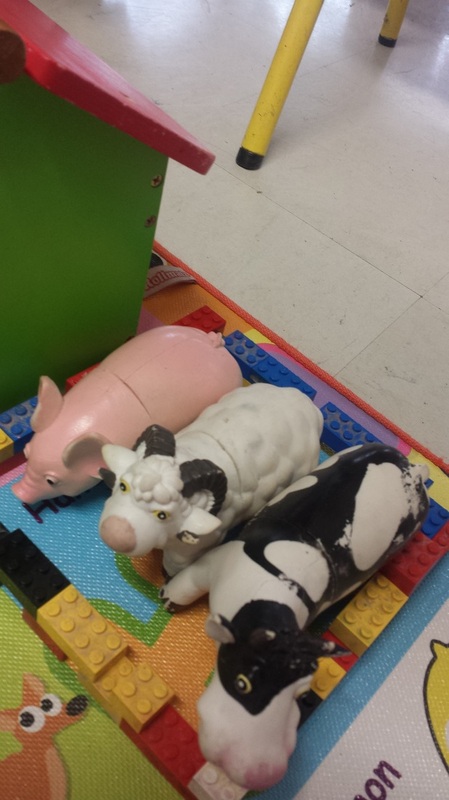 We also had some little farmyards and farm animals in the classroom! 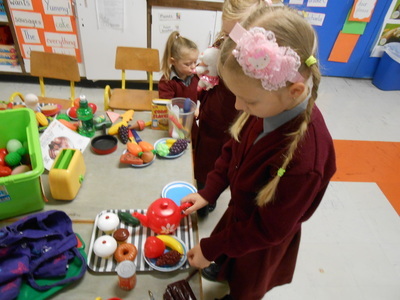 After reading the book 'Handa's Surprise', we looked at fruit and vegetables. 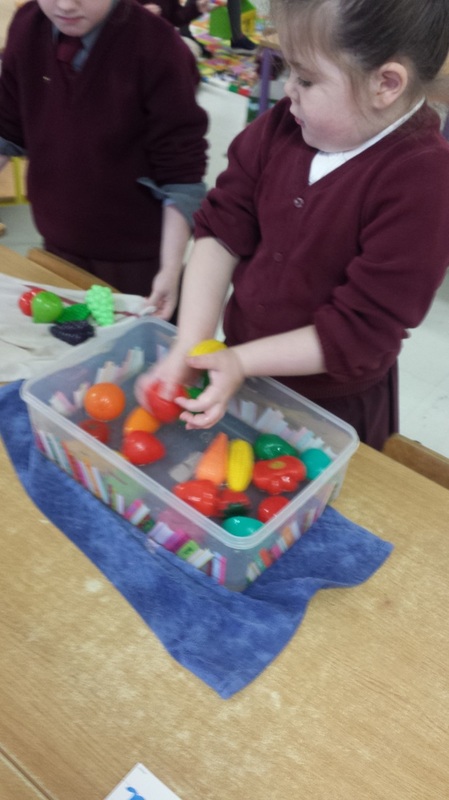 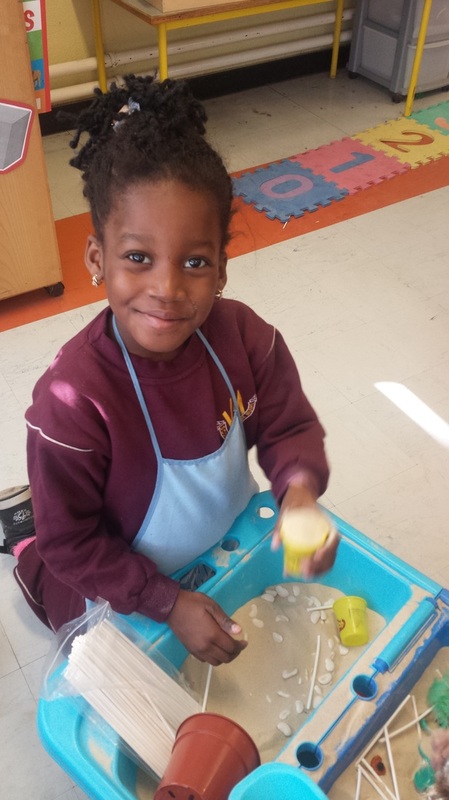 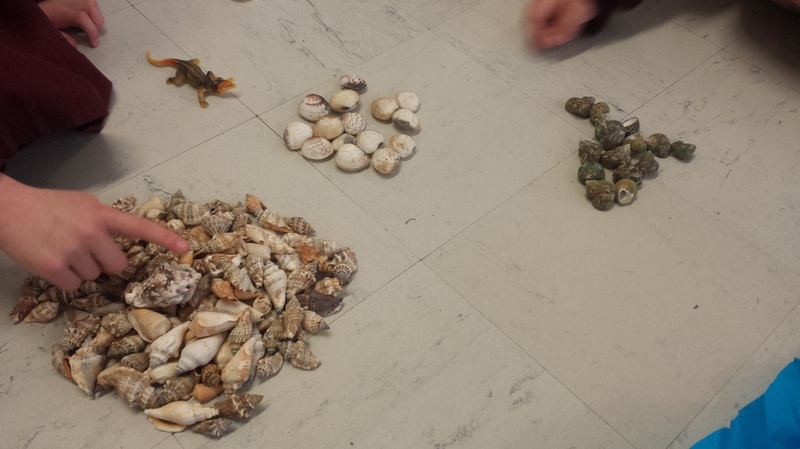 The girls had lots of fun washing them and sorting them into fruits and vegetables! 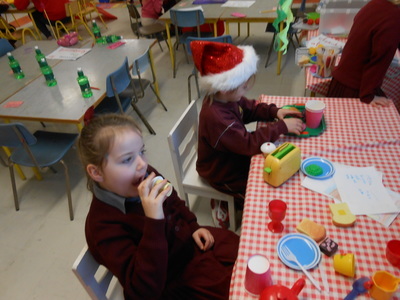 We had a very special visit from Santa Claus before Christmas! The girls were delighted with their wonderful presents and very grateful to Santa. 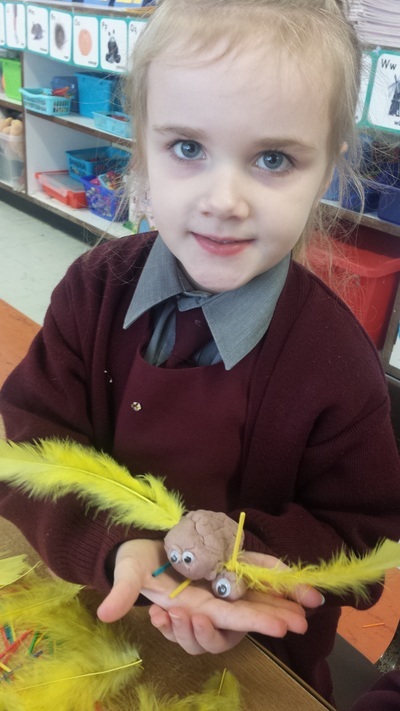 Senior Infants have been busy learning all about Autumn. We went on a nature walk to observe the signs of this season. 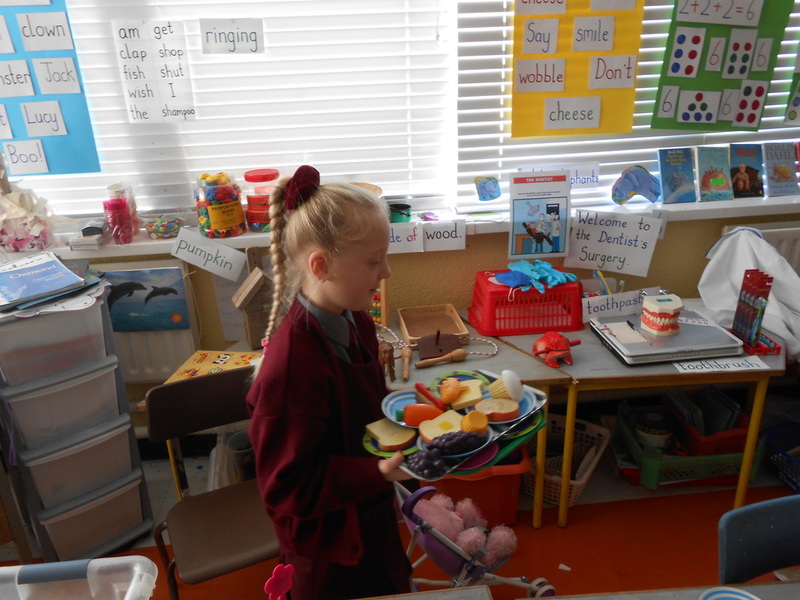 On the walk the girls collected an array of fallen leaves from different trees. 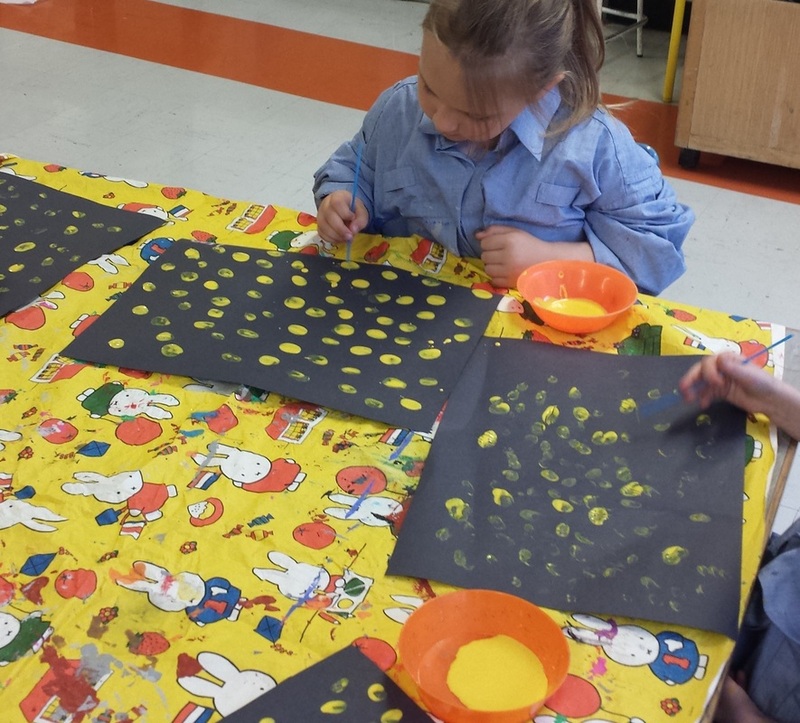 When we got back to the classroom we decided to make some leaf rubbings in the colours of Autumn. Have a look at our slideshow! 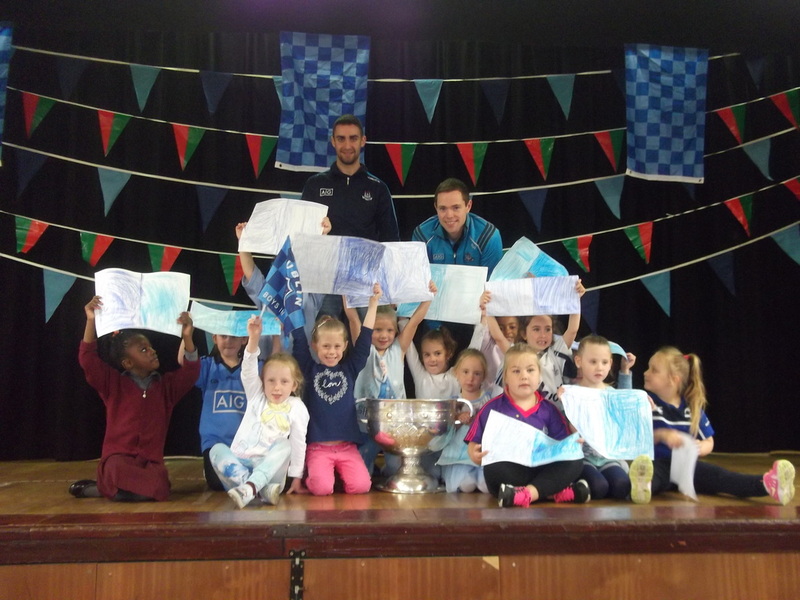 We were thrilled to have the Sam Maguire visit us on the 6th of October. Dublin players Dean Rock and James Mc Carthy brought the trophy to our school, much to the delight of Senior Infants! 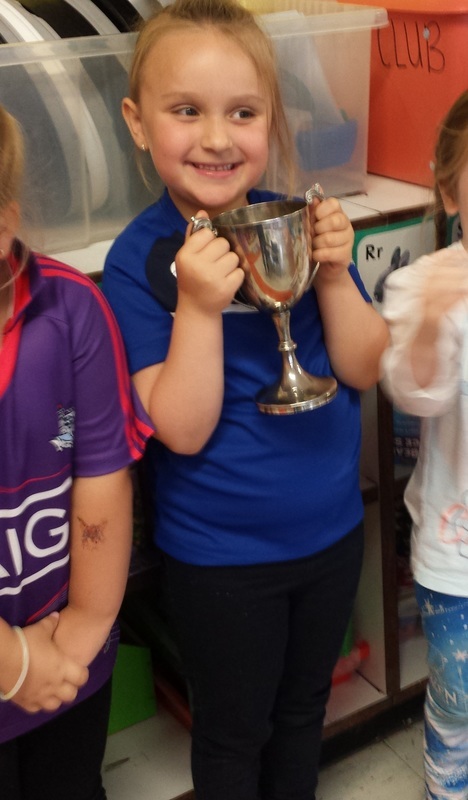 The girls were so excited to meet the Dublin stars and to see the famous Sam Maguire. 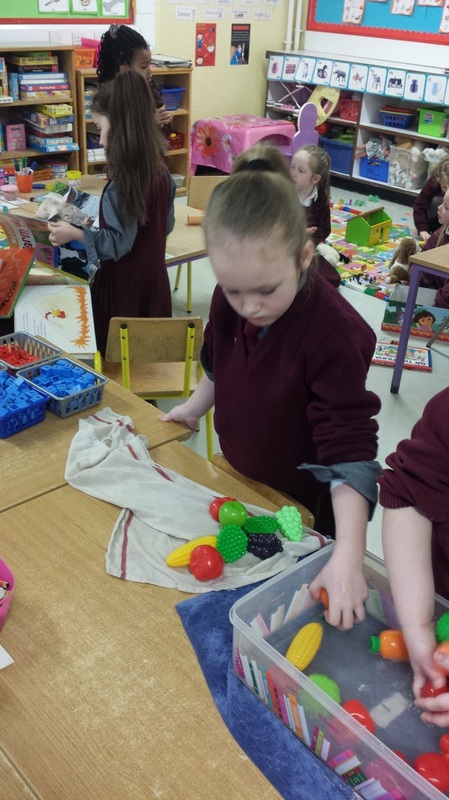 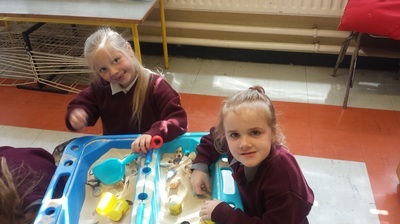 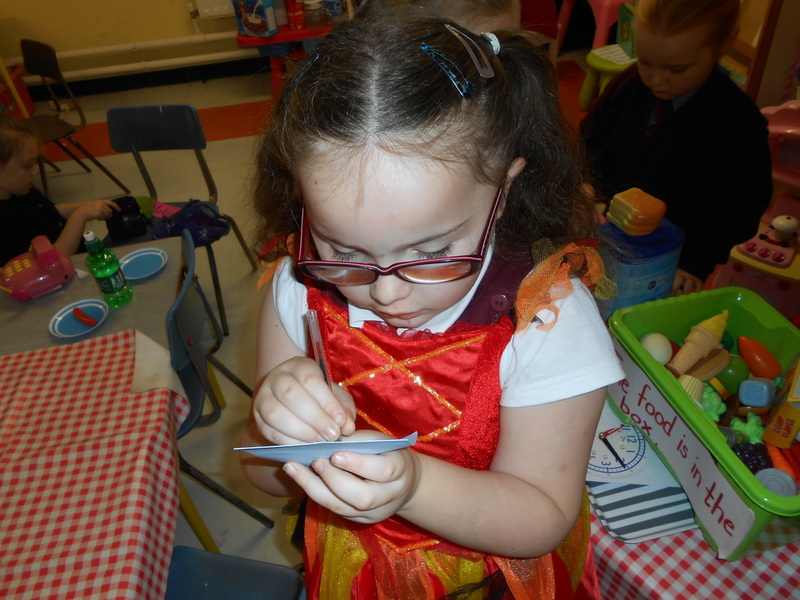 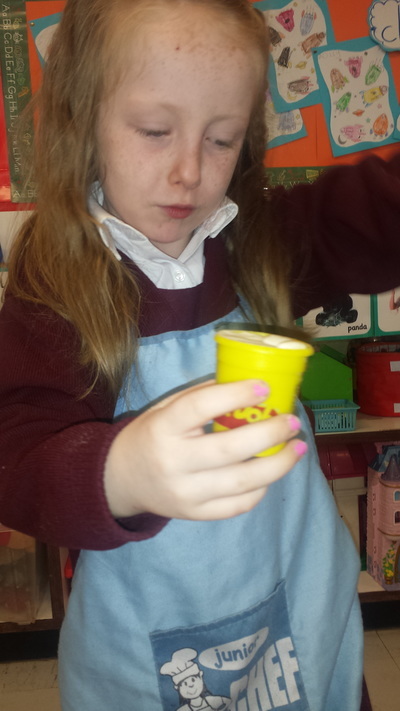 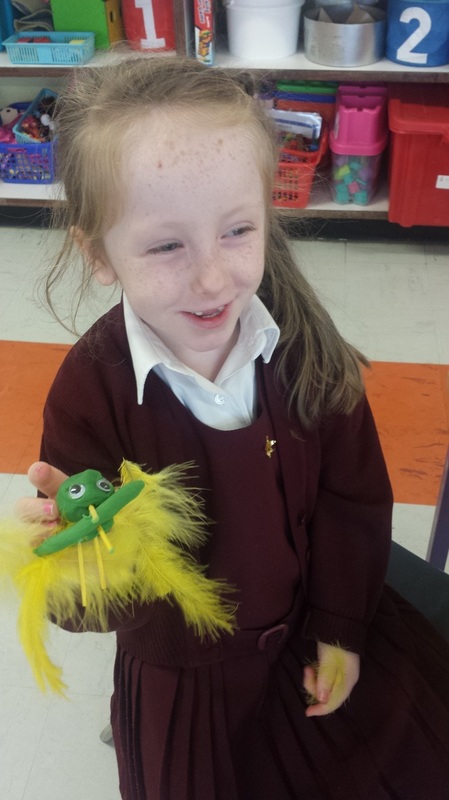 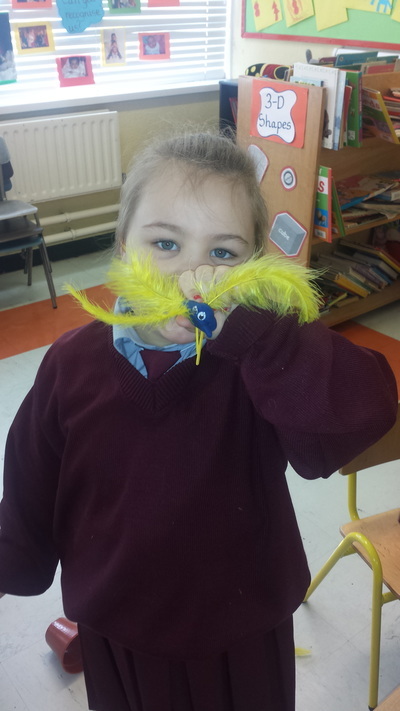 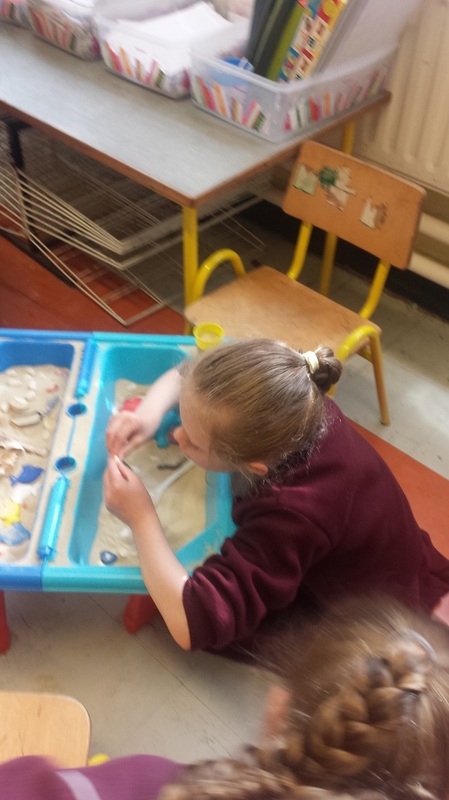 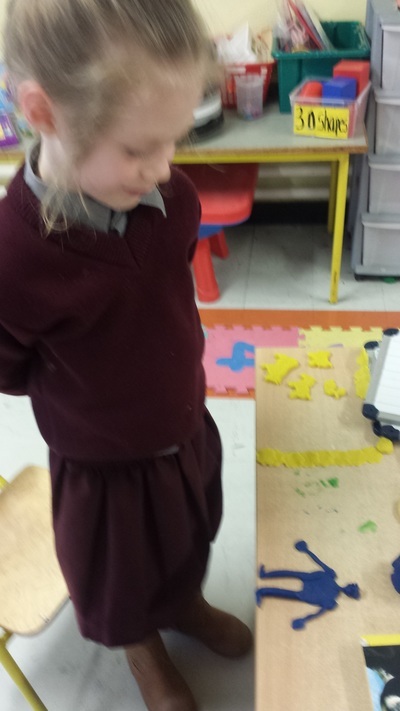 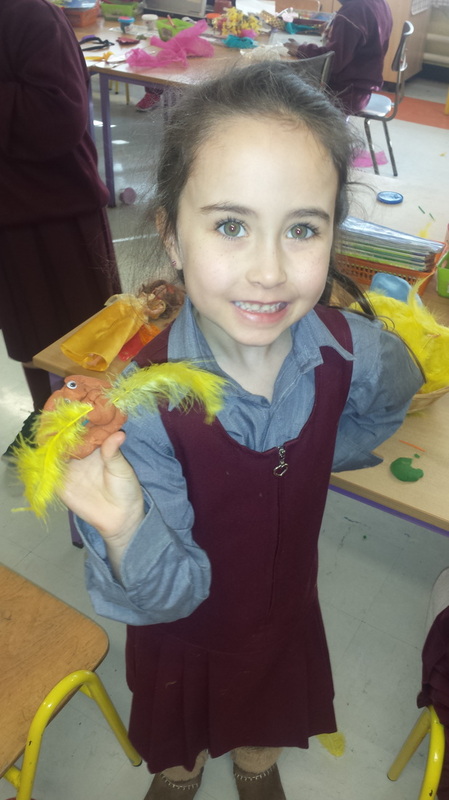 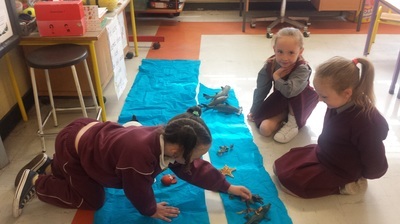 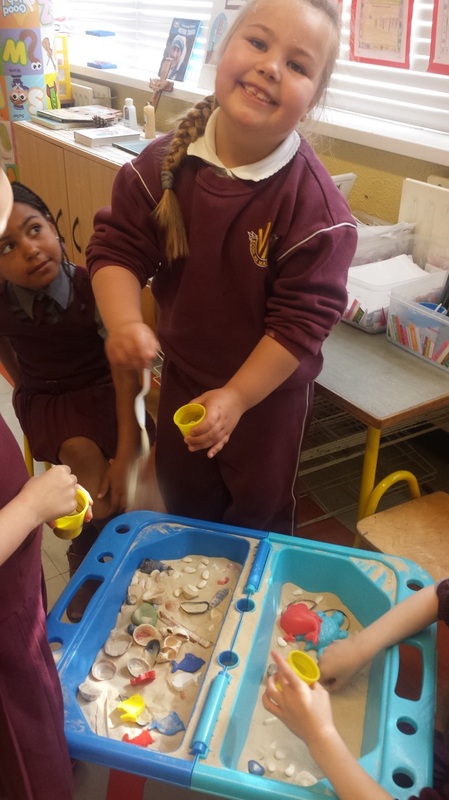 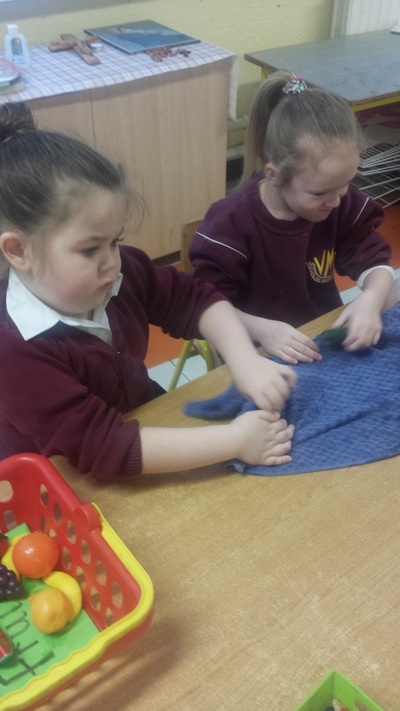 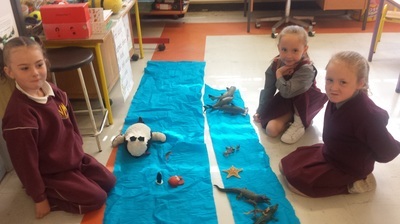 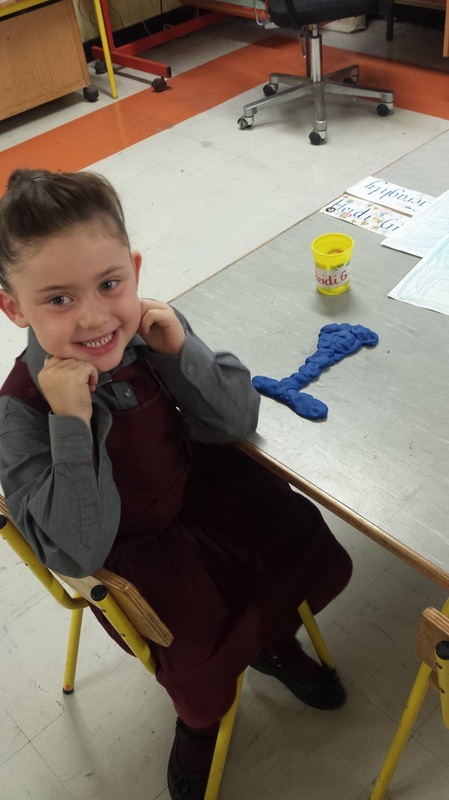 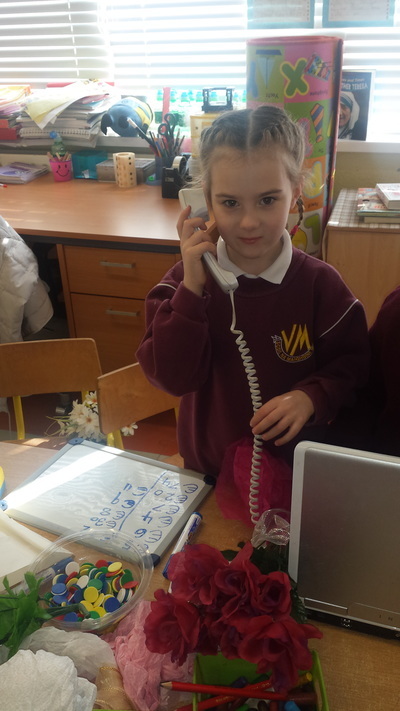 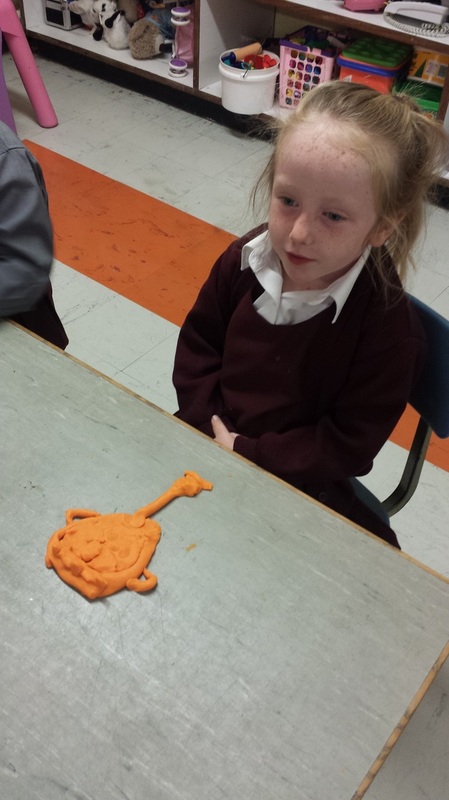 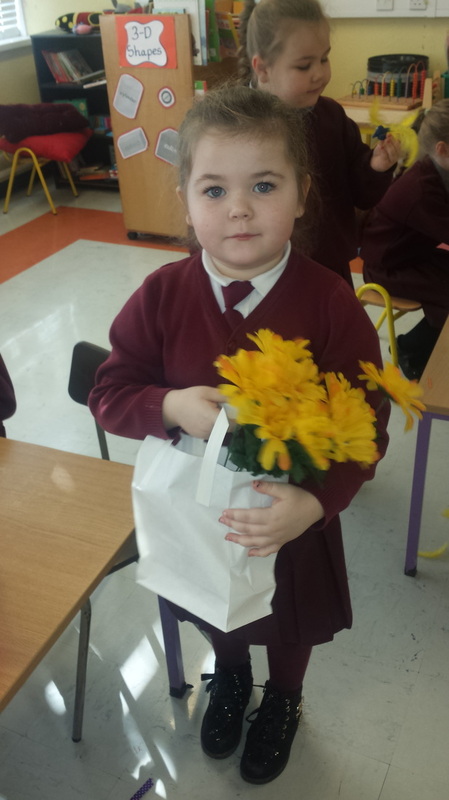 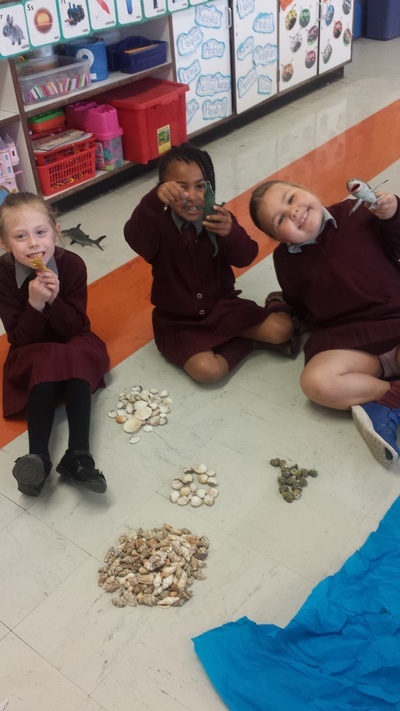 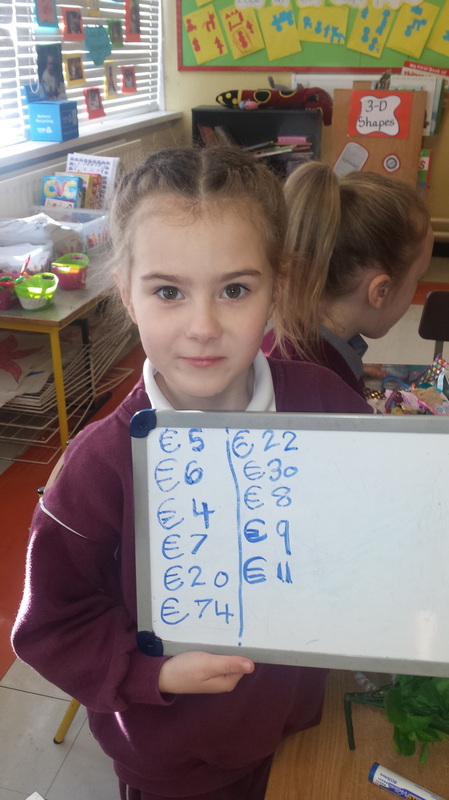 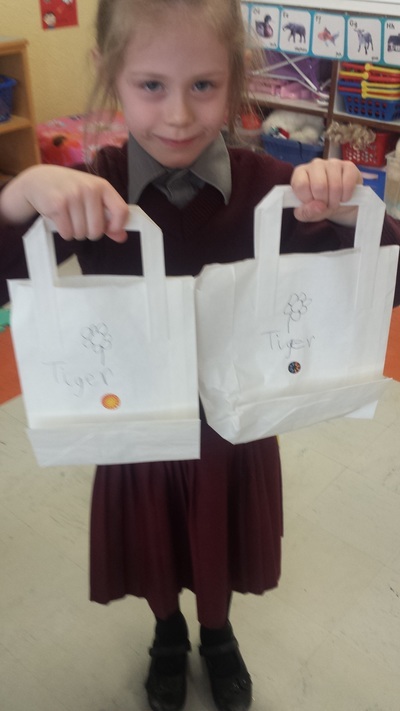 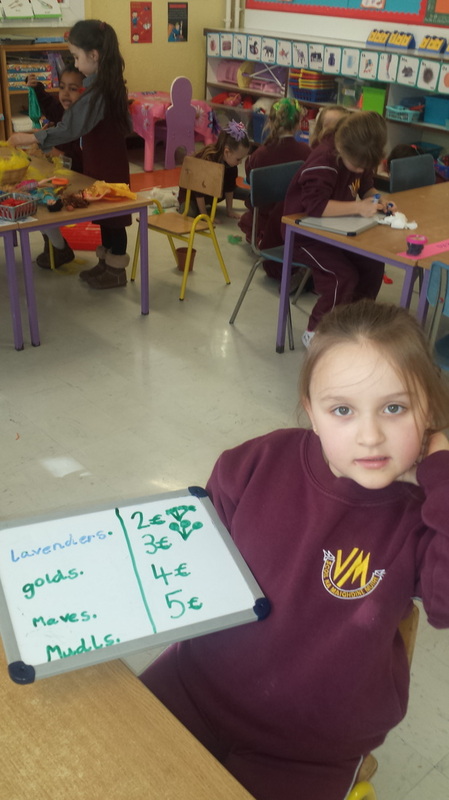 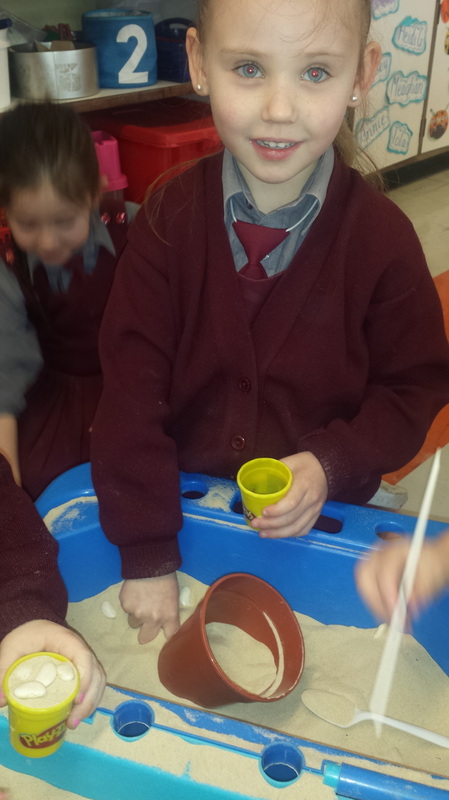 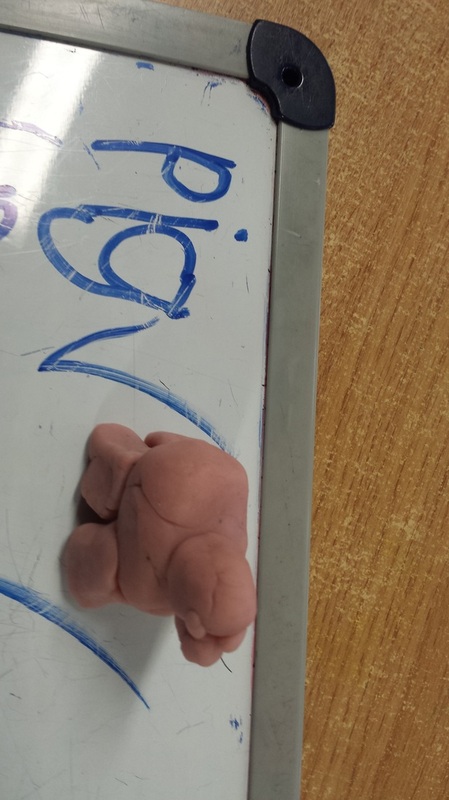 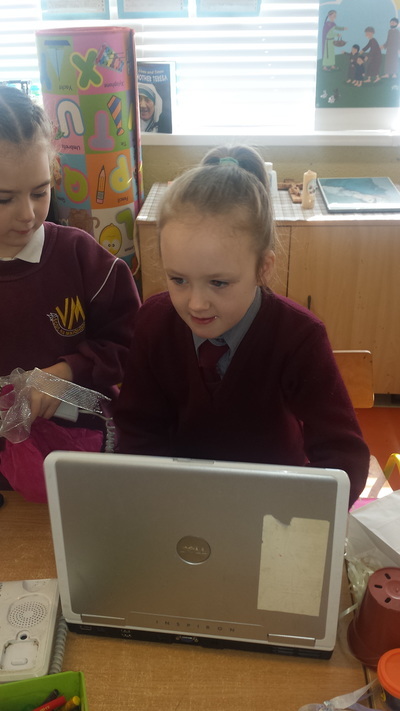 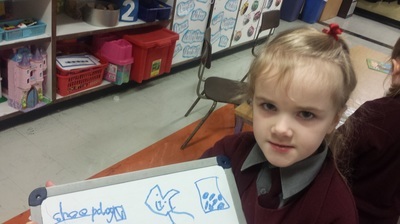 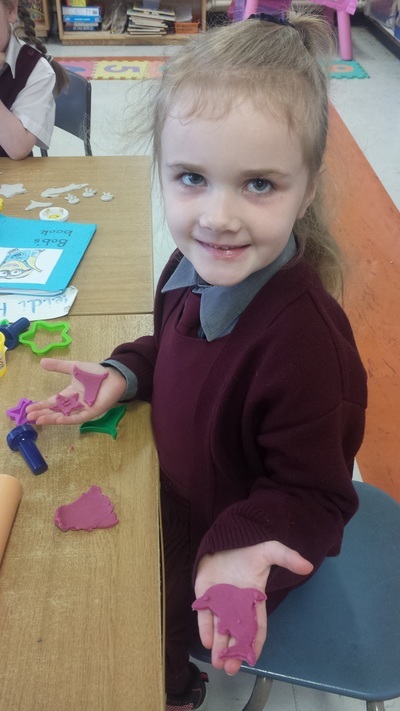 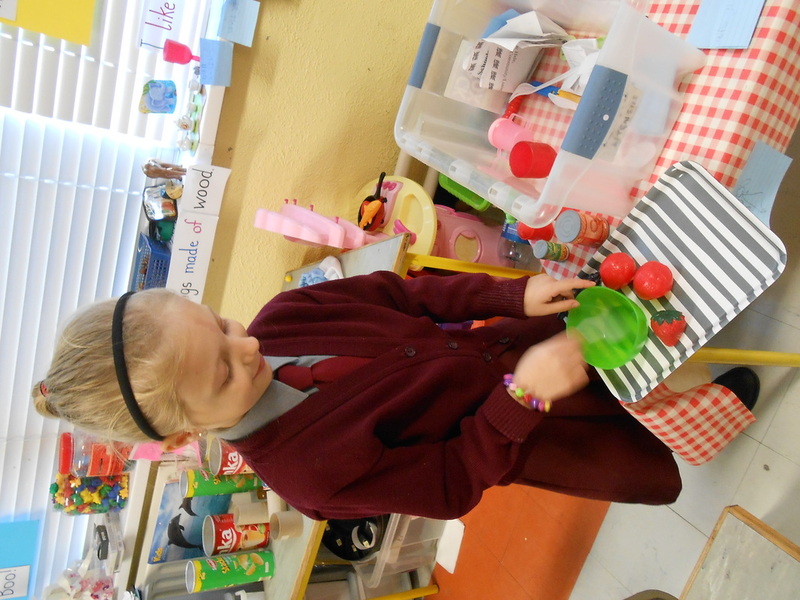 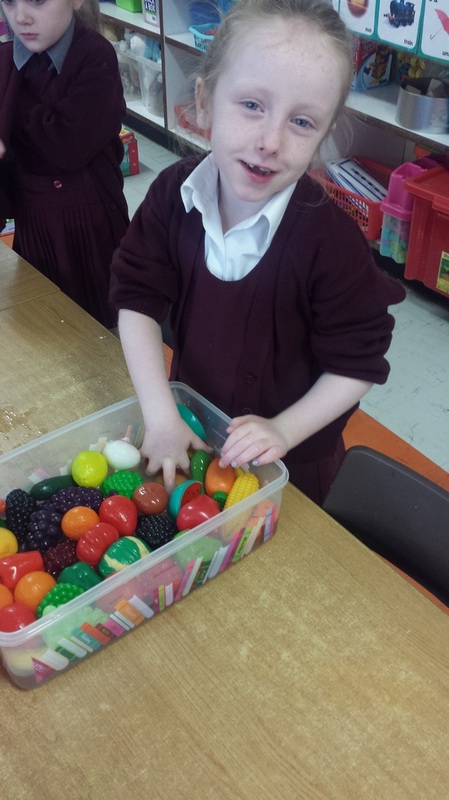 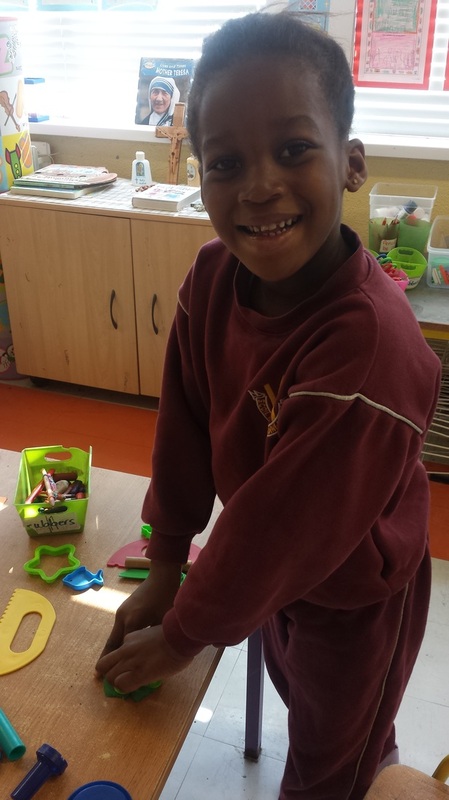 We even had our own 'mini Sam' in Senior Infants that day! The occasion inspired some of the class to create imitation Sam Maguires the following morning! 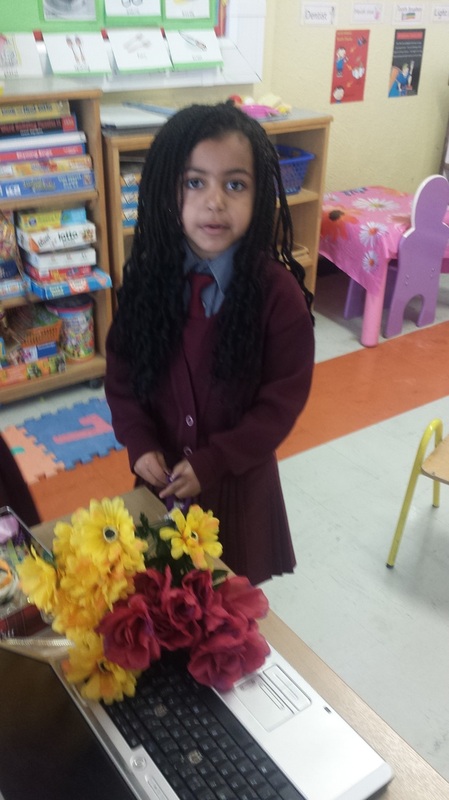 Senior Infants have been busy little bees since we came back to school! 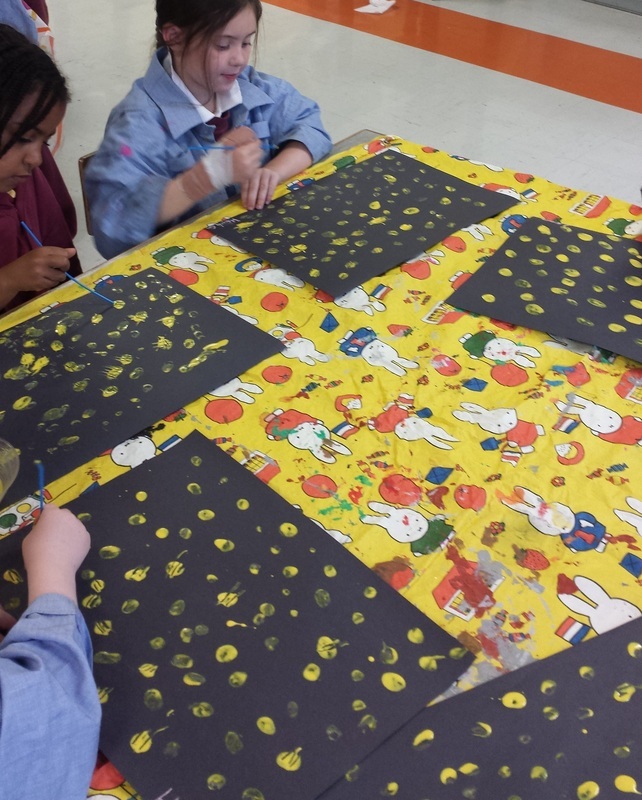 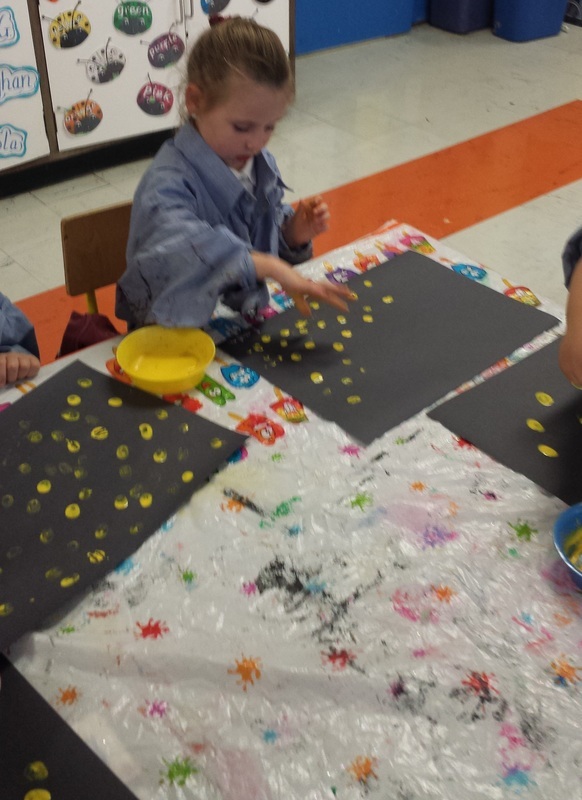 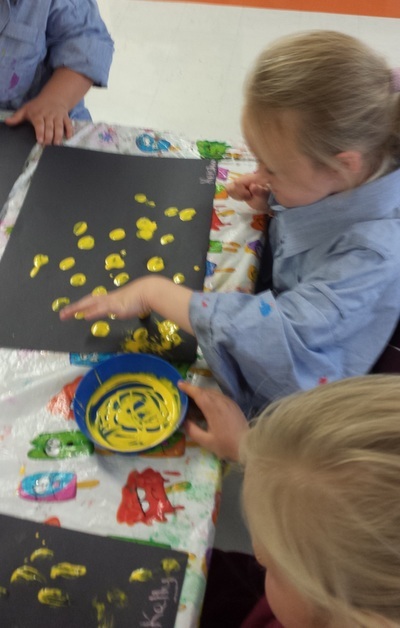 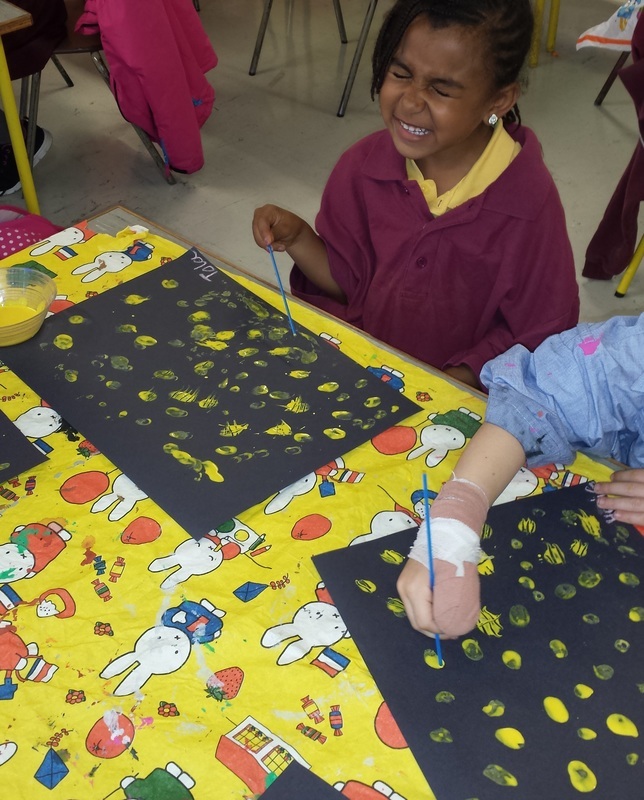 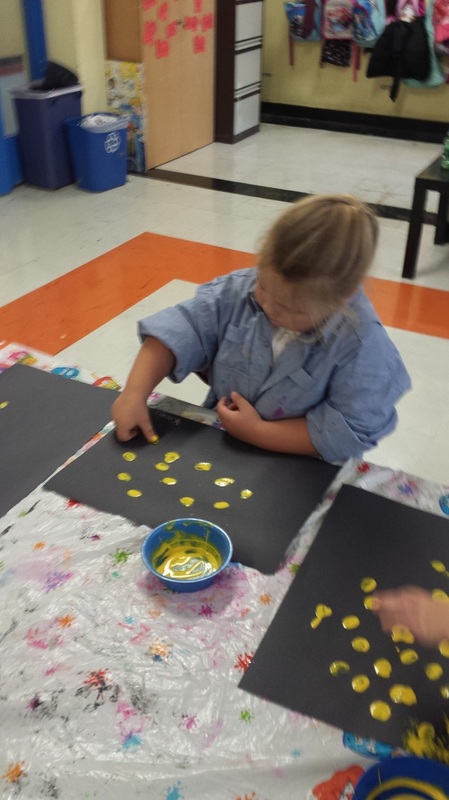 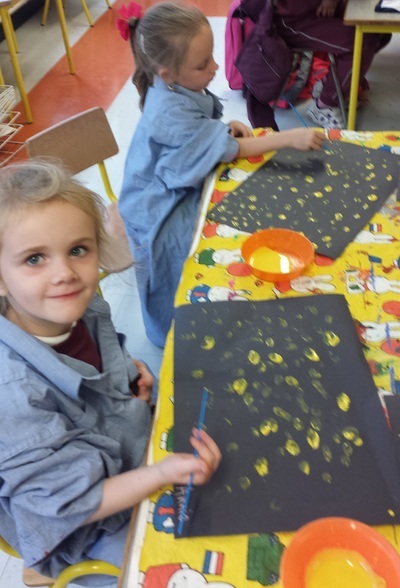 They were inspired by the Irish poem 'Bumbóg' to create buzzy bees using thumbprints. Here are some books we've been reading. A visitor to our classroom! 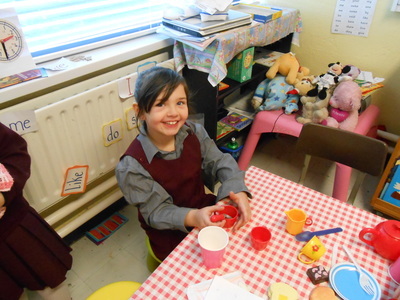 We have been learning lots about France lately and we were very lucky to get a visit from Ingrid, who is from France! 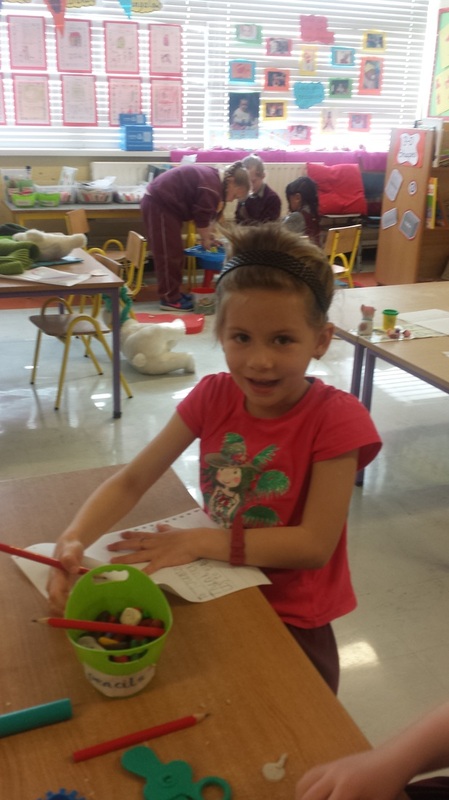 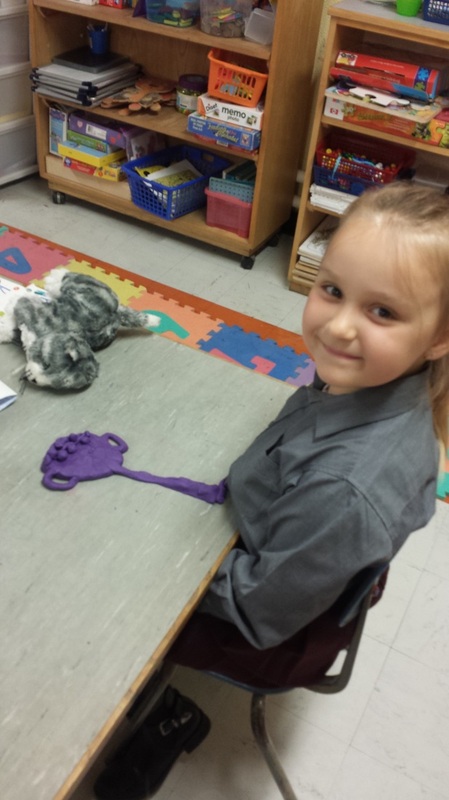 We all said "Bonjour" when she came into the classroom and we sang Frere Jacques for her. Ingrid brought us some yummy croissants to eat and we all gave her letters and pictures we made especially for her! 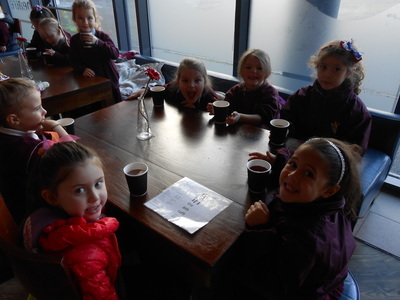 On Pancake Tuesday we all enjoyed some delicious pancakes! A Trip to the Café! 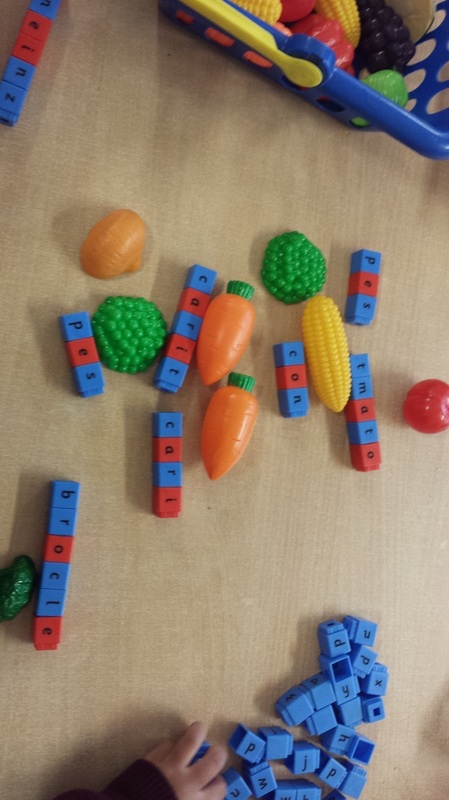 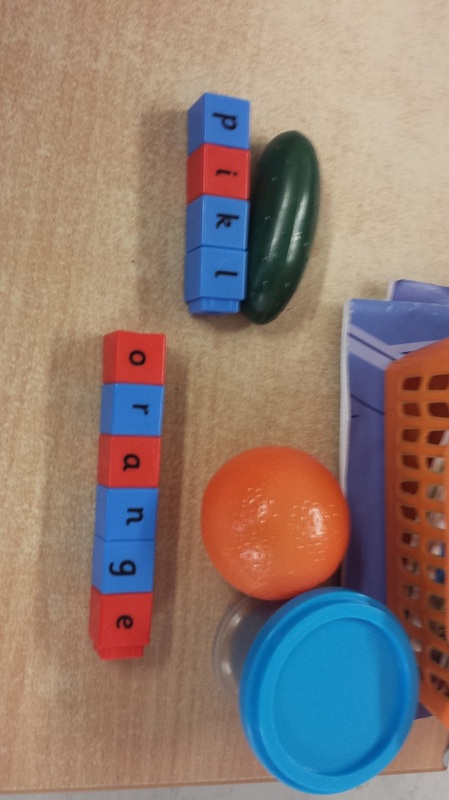 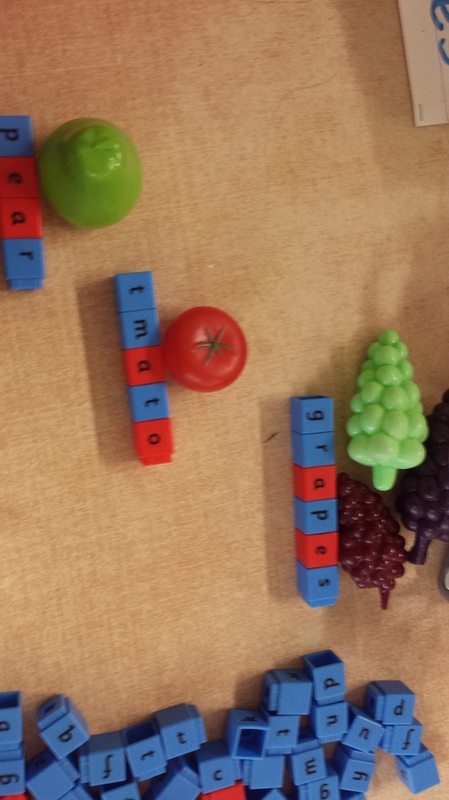 In January we learnt about different types of fruit and vegetables. 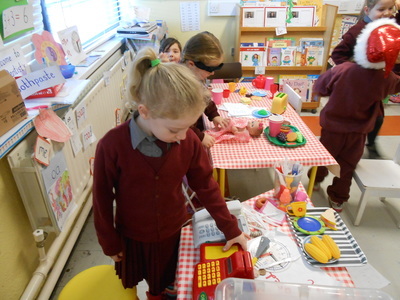 We set up a restaurant in our classroom, the girls enjoyed being waitresses and customers! 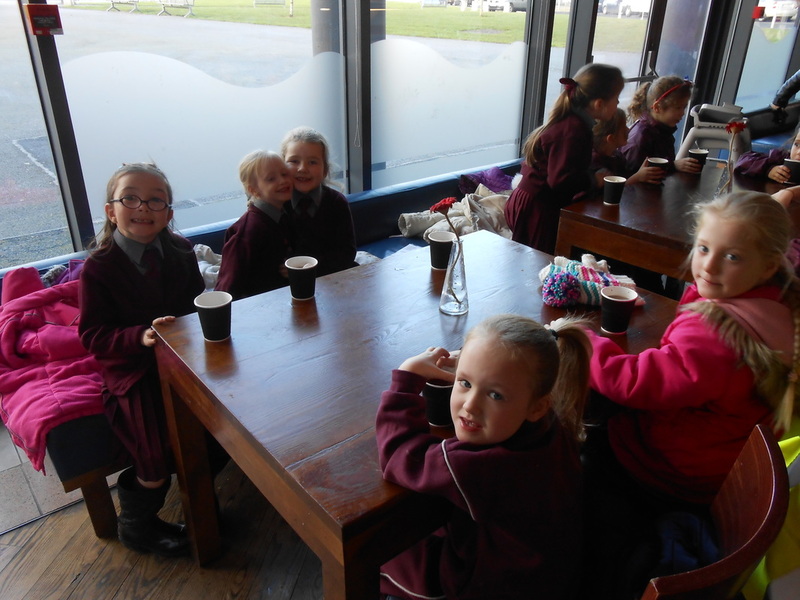 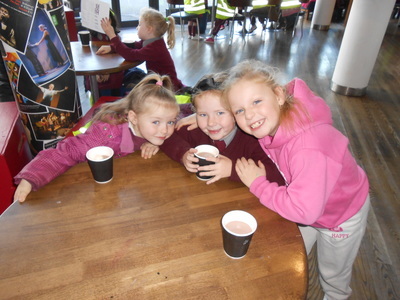 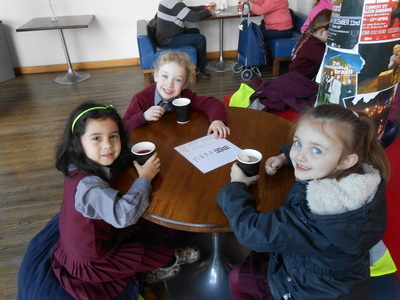 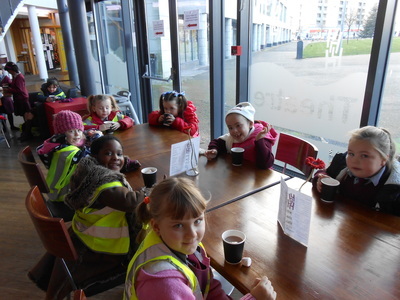 Then we paid a visit to the café in the Axis Centre, the girls ordered a hot chocolate and everyone really enjoyed the trip! 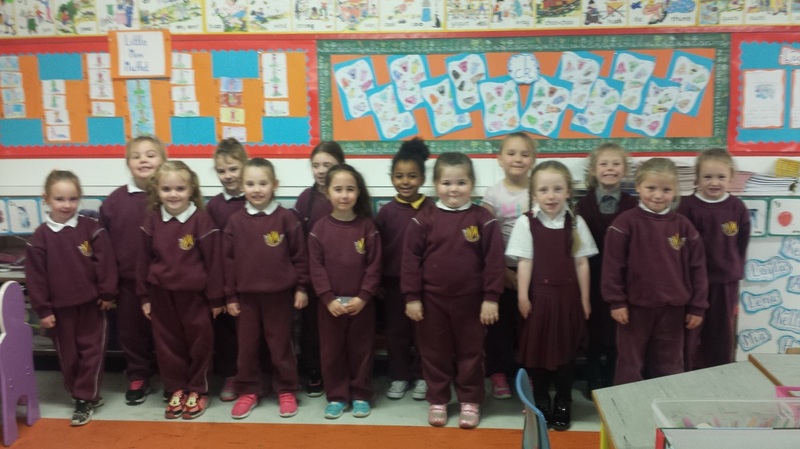 We were very lucky to get a visit from Santa Claus! He brought a present for every girl. It was very exciting to open all our presents at school. 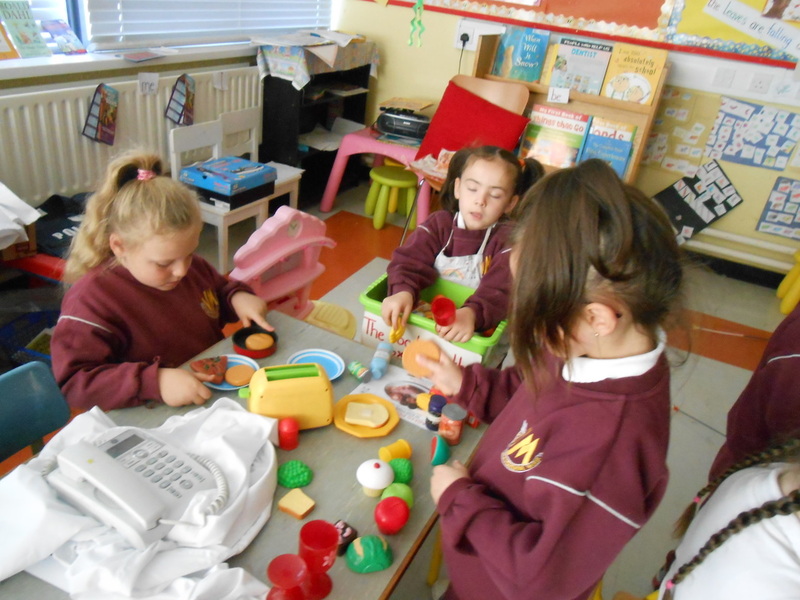 We had lots of fun playing with our new toys. 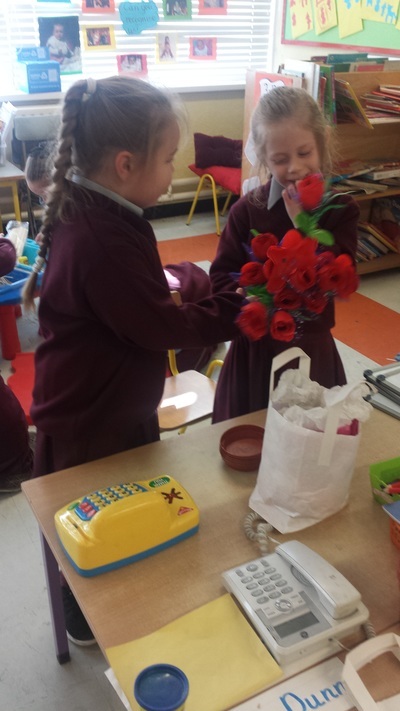 We also had a visit from some of the members of the Garda band, they played Christmas songs and we sang along. 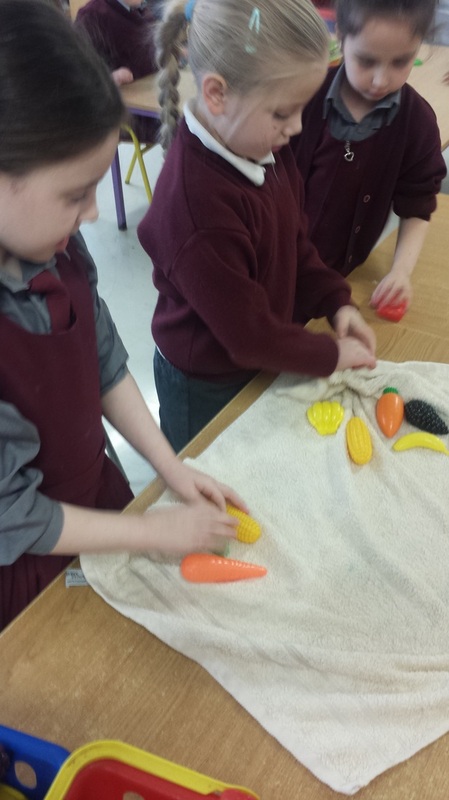 We made fruit Santas in the kitchen. 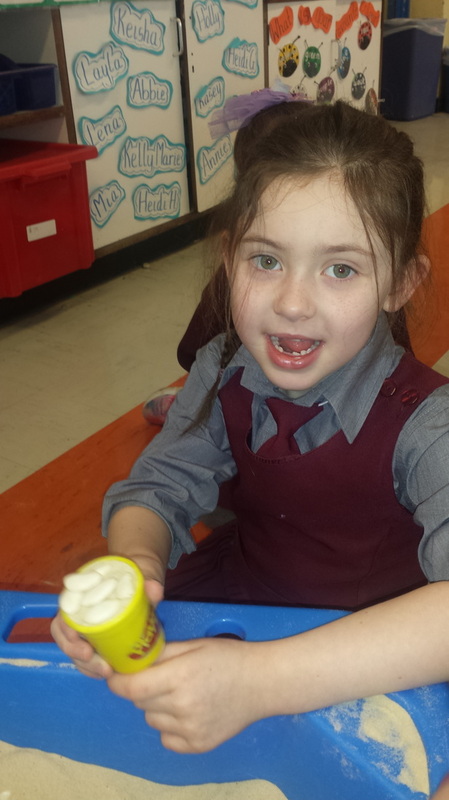 We used green grapes, a slice of banana, a piece of strawberry and a small marshmallow, they tasted yummy! 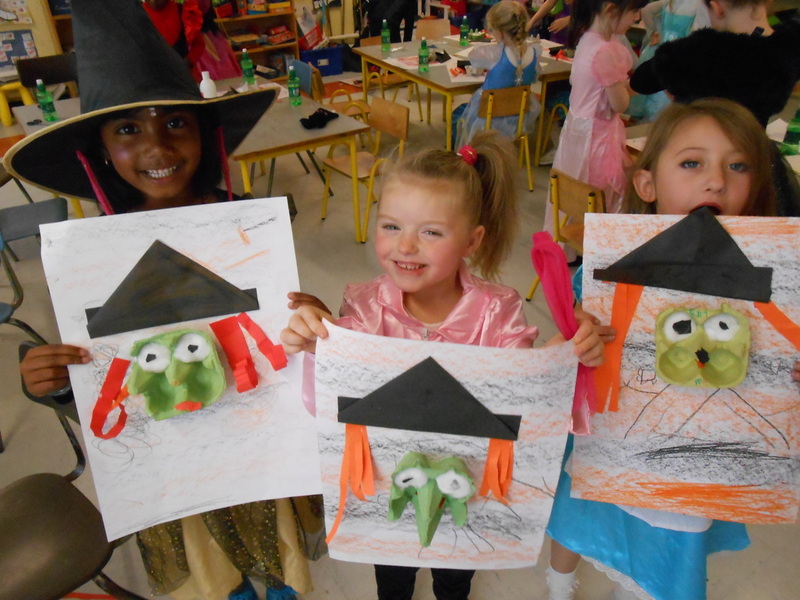 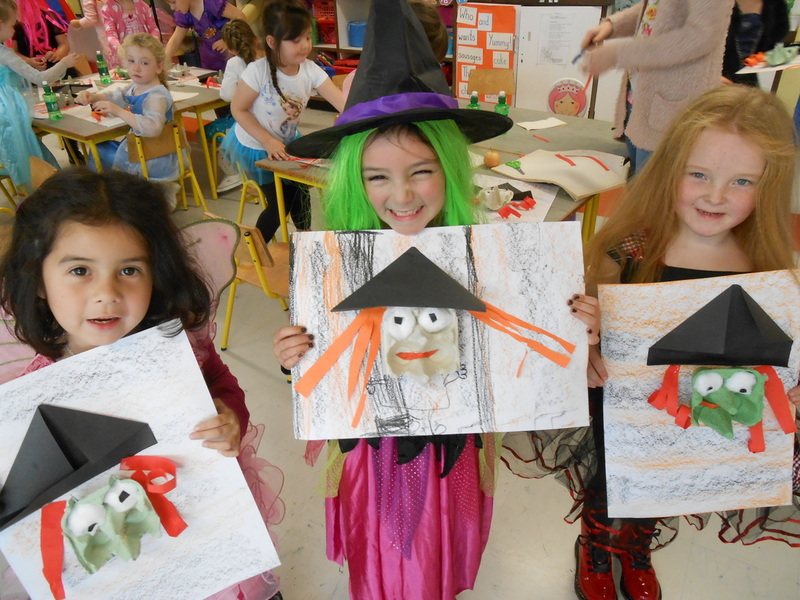 ﻿﻿On Friday of our Halloween Holidays, the girls in Senior Infants and First Class came to school in some fantastic costumes! 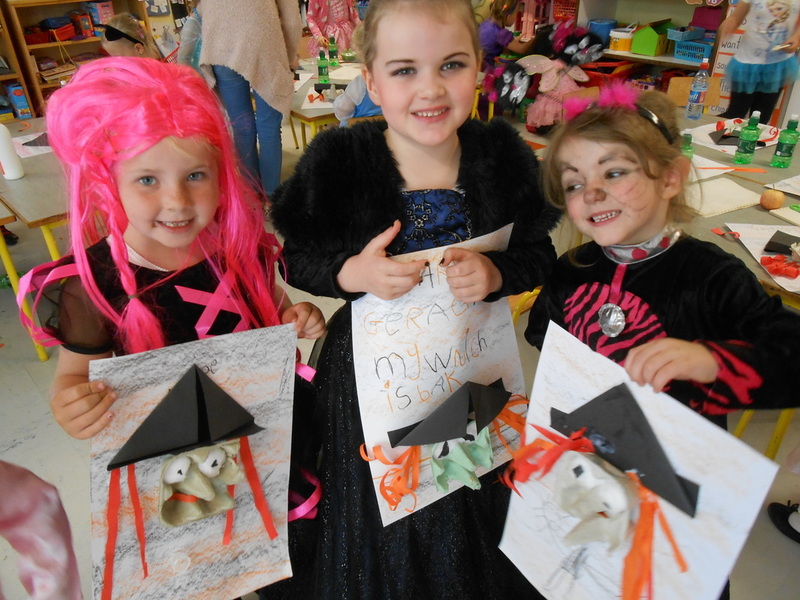 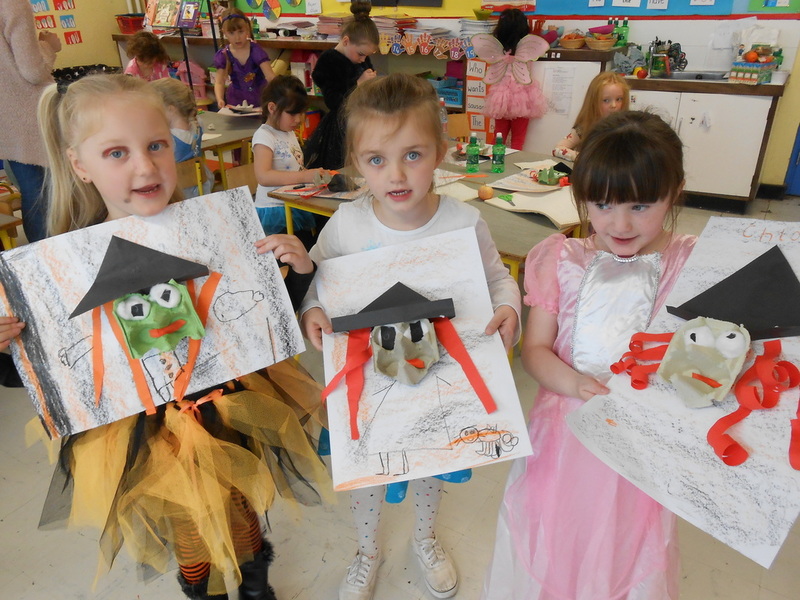 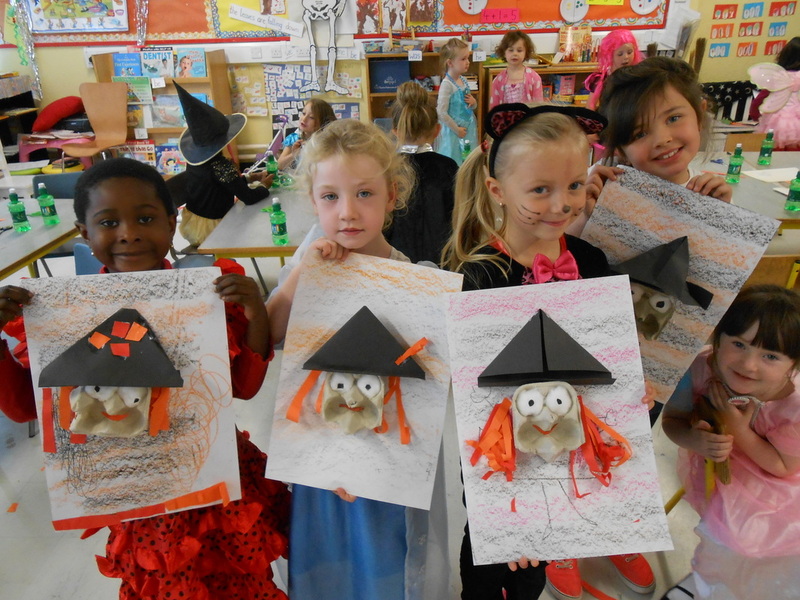 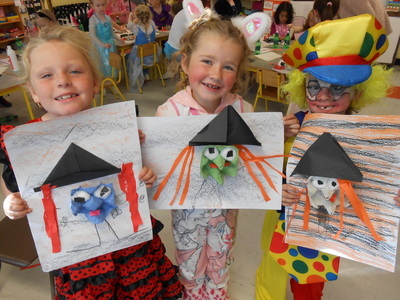 They recycled some egg cartons to create spooky Halloween Witches! 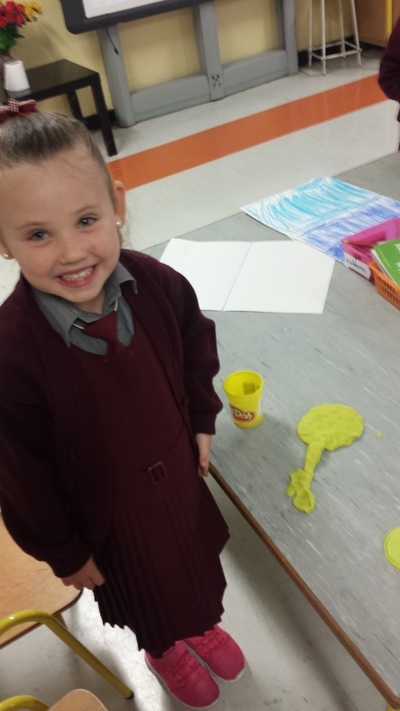 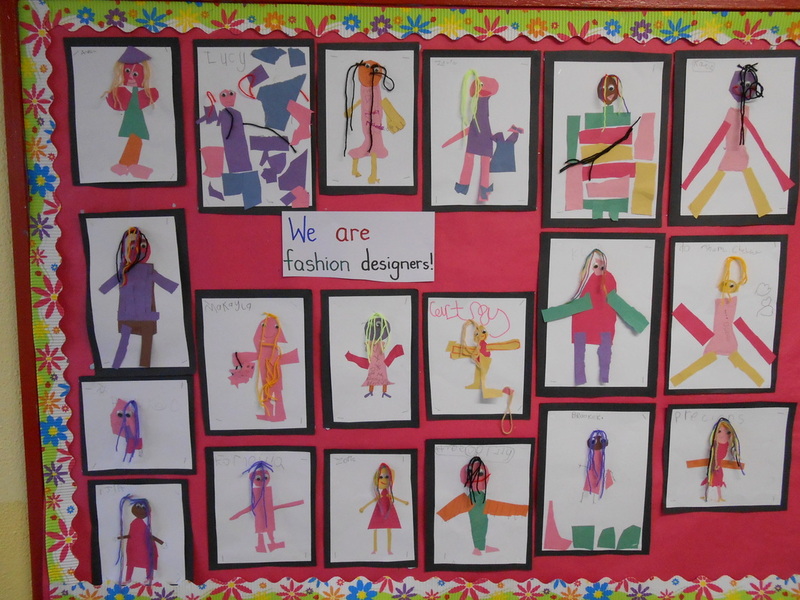 Senior Infants and First Class Art work! 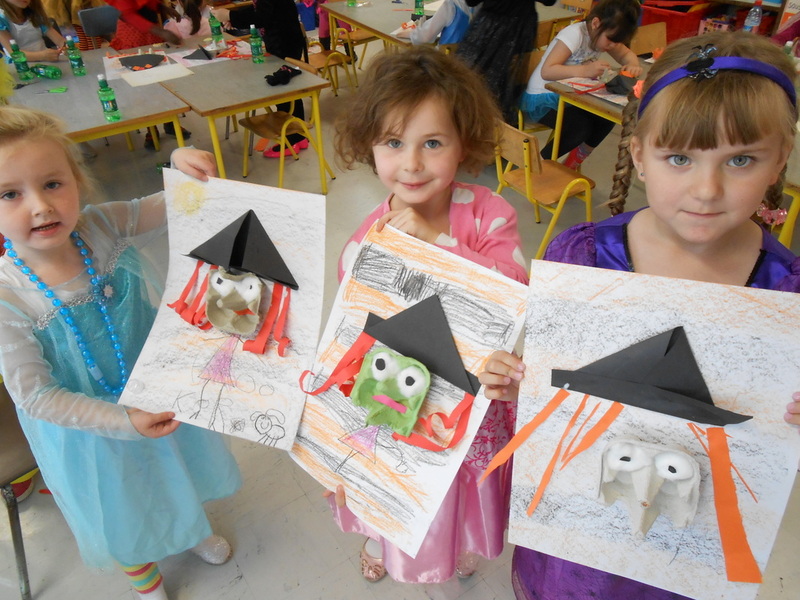 The girls in Senior Infants and First Class have done some lovely Art work already this year. 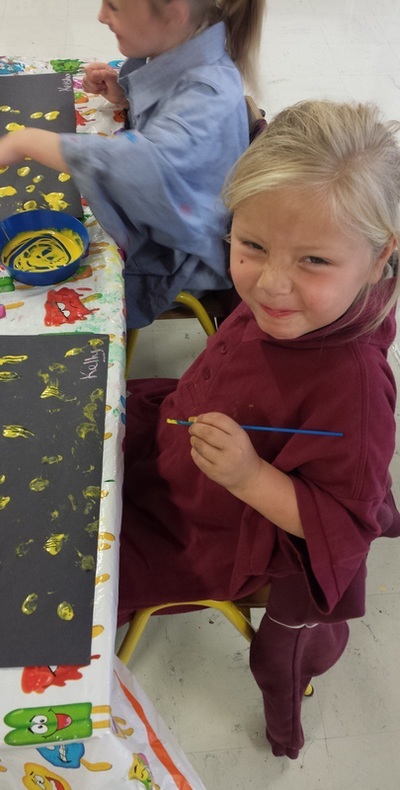 In September they experimented with oil pastels and learnt how to make fold over prints. 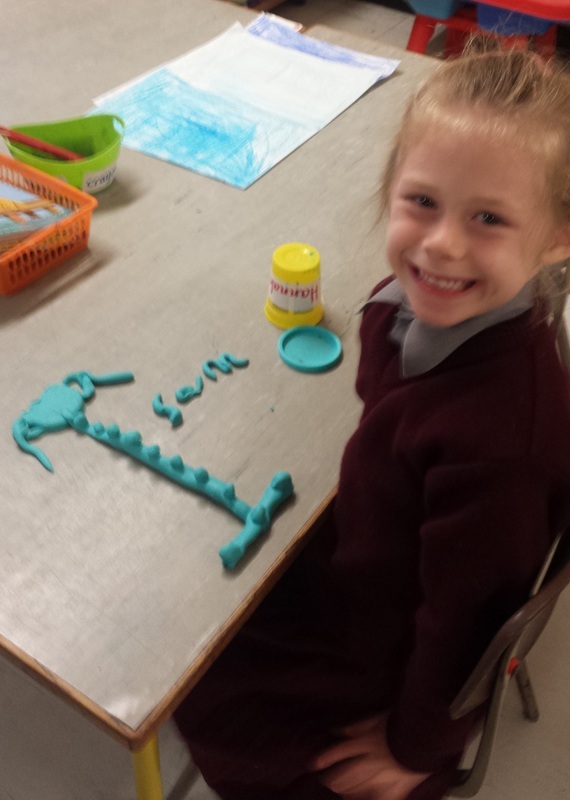 they also gave their 2-D people some interesting looking hair!